With Mother’s Day barely behind us, it is time to give our full attention to Dad—because he needs pampering, too! 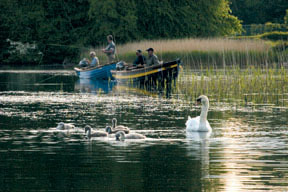 In celebration of Father’s Day this year, Ashford Castle is offering fathers the perfect getaway in the Green Isle. From the great outdoors to one of the “hottest” tables in Ireland—and beer—Dad has never had it so good. A highlight of this Father’s Day experience will be a meal in the grandeur of the George V dining room, whose renowned Head Chef Stefan Matz was recently awarded “Best Chef” by Ireland’s newly launched Good Eating Guide 2010-2011. With creative cooking, locally sourced produce and inspired use of seasonal ingredients, Chef Matz has crafted an innovative menu that has produced what is regarded as one of the finest restaurants in Ireland. Priced at €850 (approximately US$1,060), the package is based on double occupancy. Additional nights may be booked from €188 (approximately US$235) per person, per night. For more information on Ashford Castle or for other special offers, visit www.ashford.ie. Ashford Castle, which dates back to 1228, is set on 350 acres of County Mayo, on the shores of Lough Corrib and the River Cong, with a spectacular backdrop of woodlands, lake, river and mountains. In addition to the 2010 Gold Medal from the Green Hospitality Awards, other recent awards and recognitions include Trip Advisor’s 2010 top ten picks for European castle hotels and inclusion in Conde Nast Traveler’s 2010 Gold List.